Wednesday, March 18 1908 -- Of all the sporting events available on St. Patrick's Day, Herriman was assigned to the monthly harness racing meet in Agriculture Park. Ho-hum. Hen Berry continues searching for the fellow who impugned his weasel-skin hat. As we've discussed many times before, the history of early newspaper comics is cluttered with a seemingly endless list of Katzenjammer Kids rip-offs. Here's yet another one. 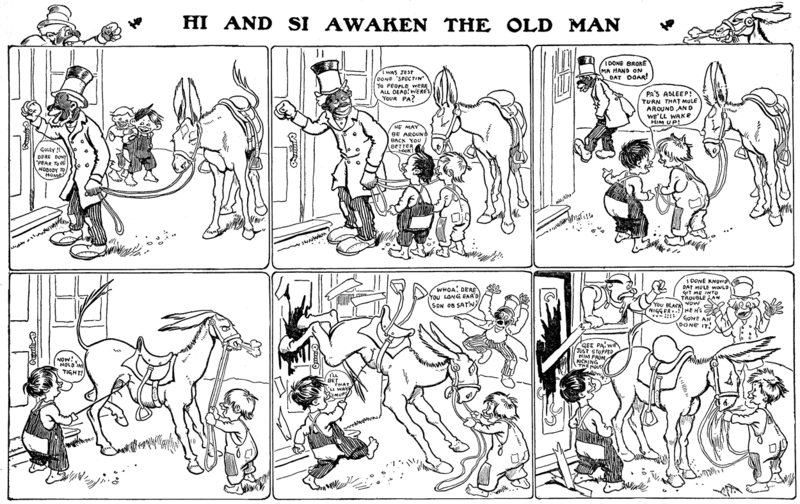 Hi and Si was done for the McClure preprint Sunday comic sections by Mark Fenderson from April 5 1903 to July 31 1904. Fenderson saw no reason to give them a colorful nationality, or provide them with a memorable nemesis, or a hook of any kind. No, they're just two rotten kids pulling pranks, and their pranks don't even exhibit any particular ingenuity. The feature is badly drawn, badly lettered and just so perfunctory that it makes me wonder if some series truly are better off left forgotten. But since I did bring it up, lets not be perfunctory about the write-up. Strips from this series were reused by McClure in their sections of 1906-08, no doubt reprinted by popular demand (he said sarcastically). Thanks (he said without any sarcasm at all) to Cole Johnson, who provided the samples! Roy W. Taylor was born in Indiana in November 1876, according to the 1900 U.S. Federal Census. In the 1880 census, Taylor was the youngest of two children born to William and Mary. The family lived in Richmond, Indiana at 32 South Sixth Street. He illustrated Strickland W. Gillilan’s Finnigin to Flannigan: An Irish Dialect Story in Verse (Richmond, Ind., Nicholson Printing and Mfg. Co., 1898). Taylor lived in Chicago, Illinois at 242 West 66th Street when the 1900 census was taken. His occupation was newspaper artist. Many of his comics are mentioned at Hoosier Cartoonists, and Lambiek. He has not been found in the 1910 census. Taylor passed away on October 21, 1914, in Washington, D.C. The Washington Herald reported his death on October 22. Roy W. Taylor, cartoonist, who died of Bright’s disease yesterday at the home of his mother, Mrs. A.L. Marshall, 723 Third street northwest, will be buried in Richmond, Ind. The body will be sent to that place following funeral services here this afternoon at 5 o’clock. Mr. Taylor was employed on the Philadelphia North American at the time of his death, and previously had been on the staff of the New York World and of the Chicago Sunday Tribune, drawing for the Sunday comic sections which give pleasure to thousands of children. He came to Washington some weeks ago feeling that he was growing weaker gradually and had not much longer to live. He was thirty-six years old. Actually, Roy W Taylor had 2 sisters, Edna and Marjorie. Marjorie was my grandmother. He is buried in an unmarked grave in the Earlham Cemetery in Richmond, Indiana. Here's one of the many short series that ran on the back page of the Chicago Daily News in their heyday of weekday strip syndication. 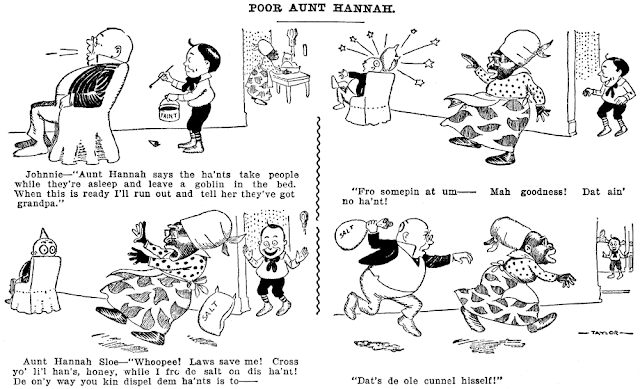 Poor Aunt Hannah is by one of my favorites, Roy W. Taylor. Pretty standard stuff, little brat making life miserable for the hired help, but as always Taylor's naive but lively cartooning lifts his work above the teeming cartoonist hordes. 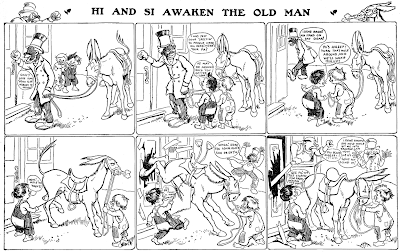 The weekday strip ran from April 22 to June 9 1902. Charles Arthur Sughroe was born in Pleasant Valley Township, Illinois on September 2, 1886, according to his World War I draft card and the Rockford Morning Star (Illinois), September 13, 1958. The original spelling of his surname was "Sughroue" as recorded on his first world war draft card, on the 1900 through 1930 U.S. Federal Censuses, and an article on his mother's death in the Rockford Register Gazette, August 13, 1929. In the 1900 census, he was the first of two sons born to John and Hannah. They lived in Stockton, Illinois. His father was a publisher. Ten years later they remained in Stockton and resided on Hudson street. Sughroe was an artist. Caralee Aschenbrenner, Prairie Advocate, profiled Sughroe. With two newspapers in Stockton, she described what happened and how Sughroe got into publishing. Competition arrived, however, in 1898 when another newspaper was added to the roster of Stockton businesses, the “News.” The rivalry continued until 1919 when shrewd thinking determined that two newspapers in a town the size of Stockton was one too many. [John] Sughroe bought the "News" and combined the names into “Stockton Herald-News” in 1912. Sughroe’s son, Charles, contributed to the newspaper columns his first cartoon. He loved to draw and had decided to become an artist at that early age. Of course, in the newspaper business, family is often staff, so Charles helped at the paper in many ways, “groomed,” as they say to one day take charge! ...His talent for drawing and painting culminated in going to Chicago to the Art Institute to school hoping to pursue an art career. He had become acquainted with two other local artists-illustrators, Nate Collier, Pearl City and Howard Smith of Pleasant Valley, his dad’s home when young. They had all three graduated from the Art Institute so felt a kinship for that reason, too. On June 5, 1917, Sughroe signed his World War I draft card. His occupation was journalist. His description was tall height, medium build with blue eyes and dark brown hair. Prairie Advocate said: "…he was inducted into the Army at Camp Grand, Rockford in February, 1918…[and] was sent to France in late 1918. "; the site has a photo of Sughroe in uniform. The start date for Mickie the Printer's Devil as a panel is not yet known. The earliest one found, at this time, was published in the Casa Grande Bulletin in January 1918. 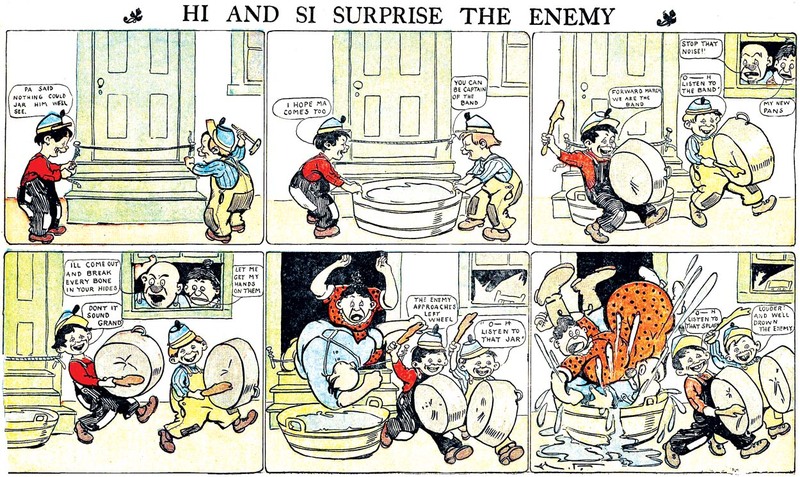 The panel was alternately known as Mickie Says, while the original name was re-used for the strip, which apparently began in 1920; samples of the strip are at Barnacle Press and Chronicling America. We shall tell about the man who made the printer's devil a national figure. Out at Stockton, Illinois several years ago a father and son engaged in enlightening the populace through the medium of a weekly newspaper, and meeting all the difficulties and tribulations of those whose efforts lie in that direction, and realizing that the country editor was usually deprived of a square deal in his relations with those upon whom he depends for support, conceived the idea of talking to the readers of the Stockton Herald-News through the medium of the printer's devil of the office, who was dubbed Mickie. The father was John Sughroe, who yet is the publisher and editor of the Herald-News and the son was Charles Sughroe, the cartoonist whose name is familiar to the readers of country newspapers in almost every county of the United States. Mr. Sughroe's pictures of Mickie and his doings do not give the least idea of the artist himself. The little cuss usually is shown in the most violent action of mind or body while Charley Sughroe is more than six feet tall, serious, soft spoken and precise in his diction. It would seem that Mickie is so much of him that his language would be that of the cartoons. Mr. Sughroe was reared in the newspaper business and his earliest recollection is of an assignment to a dishpan containing the entire remains of a pied newspaper page for after school distribution. He was the original Mickie and washed forms, swept out, bathed the rollers and was initiated into the mysteries of the type louse fraternity at an early age. He was in sole charge of the newspaper for four years, and besides calming irate subscribers and doing the chores the average country newspaper man, is accustomed to, he made chalk plate illustrations He spent four years at the Chicago Art Institute and gained much experience in the free lance commercial game for a like time afterward. He exhibited paintings in the galleries of the Art Institute. But Mickie led to the fame and considerable fortune for Mr. Sughroe The little cuss fitted in so well with the needs of the country publisher that he was adopted at once in thousands of newspaper offices as one of the most important members of the force. For by this means the country newspaper game is boosted in every way possible the subscribers are bawled out something awful but in a way to make them laugh and take the criticism in a friendly way. Every Mickie cartoon is founded on some actual happening so it is not overdrawn. 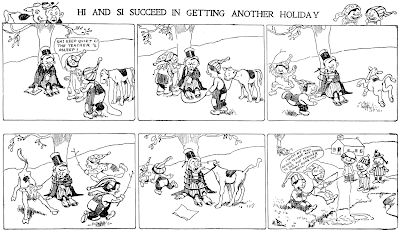 Mickie first was offered in little single column cartoons and made an instant hit. Then his scope was enlarged to the strip form, six columns wide, and the success of the strips has been even greater than that of the single comics. 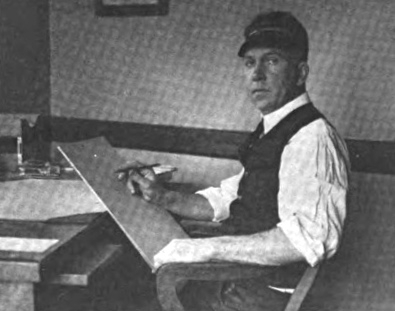 When Mr. Sughroe went to Chicago to show his first Mickie drawings to Wright A Patterson, editor in chief of the Western Newspaper Union, Mr. Patterson, himself an old country newspaper man instantly recognized the appeal of Mickie's sayings and doings and placed Mr. Sughroe on the WNU staff then and there. Mr. Sughroe, however, does his work at Stockton where he can absorb and utilize the small town ideas which are necessary to present Mickie at his best, and where the objects of Mickie's wit, satire and wisdom abound. The small town also provides much material for Mr. Sughroe's other series, People of Our Town and Town Pests, which are so true to small town life that they have attained a wide popularity also. However, Mr. Sughroe recently made a trip East which included Washington, Philadelphia, Pittsburg, Atlantic City, New York and other cities where Mickie had never been and the strips soon to be released will detail impressions and adventures such as only Mickie would have in those cities. Mr. Sughroe holds no long hair Bohemian ideas. He believes that an artist should keep in touch with the work-a-day world and be of service through his productions; that the newspaper business is one of the livest, affording ample opportunity for the man with brains and a willingness to work. He is interested in art exhibitions, New York, linotypes, letters from editors using Mickie cartoons, the American Legion, automobiles, any old kind of a dog, the other fellow's cartoons. His favorite occupation, beginning November 1921, is staying at home, as Mickie acquired a charming young mamma, formerly Miss Marie Donahue, on the fifth of that month. She has agreed to let Mickie wear his hair in his regulation uncombed style and to retain his favorite exclamation, "Gosh!" The American Magazine, Volume 104, July–November 1927, published Patterson's recollection of his first meeting with Sughroe. "About ten years ago a young fellow named Sughroe came to my office to sell an idea for a one-column cartoon which he called 'Mickey Says.' Mickie was a freckle-faced printer's devil who wise-cracked about any subject under the sun, but always with a grin." "The country was in the midst of war just then. I was thinking war, and not much else. Therefore, instead of looking for reasons why Sughroe's idea might be good, I looked hard for a way to turn him down nicely. "He literally jumped at the chance. "Well, Mickie went like wildfire. Inside two weeks we were sending young Sughroe—he wasn't yet of age—a check for more than five hundred dollars as his share to date. The feature is as popular to-day as ever; more popular, in fact, because almost everybody knows Mickie. That lad can tell subscribers to pay their bills, and he gets a smile—and a check—when a formal statement of account would go into the wastebasket." According to the Rockford Morning Star, Sughroe married Marie Donahue on November 5, 1921. In the early 1920s he produced another panel called Bill Booster Says. The strip was carried in the Blair Press (Wisconsin); samples from March 29, 1923; April 19, 1923; and November 13, 1924. Around mid-1926, he assumed drawing Such Is Life from L.F. Van Zelm; samples of the strip are at Barnacle Press. His mother passed away August 13, 1929. He was recorded, in the 1930 census, in Stockton at 308 North Simmons Street, and lived next door to his father, who was at 312. His occupation was newspaper work. His father passed away in 1935 according to records at the Holy Cross Cemetery. He was at the same address in the 1940 census, and worked as a local newspaper publisher. On April 27, 1942, he signed his World War II draft card. His description was six feet two inches, 220 pounds, with blue eyes and gray hair. Sughroe passed away September 12, 1958 at the St. Francis Hospital in Freeport, Illinois. His death was reported in the Rockford Morning Star the following day. He was buried at the family plot in Holy Cross Cemetery in Stockton Township. Calling Mickie the Printer's Devil an obscurity really isn't fair to the feature. Though totally forgotten today, back in the 1920s in most small communities Mickie was a well-known little fellow. Decades later, though, information about him has been hard to track down. First of all, an explanation of the title. A 'printer's devil' was a kid apprentice who helped out around a print shop. His duties typically involved sorting type, cleaning machinery, sweeping up and so on. The origin of the term is murky -- some contend that the boys were so dirty from all the ink that got splattered on them that they looked like little devils. Others prefer the explanation that since the kids spent lots of time sorting and disposing of the hellbox contents (term for a box of pied type) that the devil title went along with that somehow. Cartoonist Charles Sughroe, who spent time as a printer's devil himself at his father's newspaper, came up with Mickie as a character who could gently remind newspaper customers to pay their bills on time, to make use of classified ads, to call in local news, and so on. He took the concept to the editor of Western Newspaper Union, a syndicate that supplied material mostly to rural newspapers, who immediately saw a winner and snapped it up. At the time Mickie was a panel cartoon. Sometimes titled Mickie the Printer's Devil, but more often the shorter Mickie Says, the feature seems to have debuted in January 1918. This panel cartoon bedeviled my research for years, because I assumed that the panel had to have grown out of the comic strip. I could never figure out why I consistently found Mickie Says panels much earlier than any strips. In reality that was exactly as it should be. It wasn't until Alex Jay found an article from American Printer & Lithographer telling the history of the feature that I was set straight (you'll see that complete article tomorrow). The panel cartoon, by the way, does not get its own listing in the Guide because I have never been convinced that it was produced and distributed at a definite regular frequency, or that the art wasn't frequently re-used. The comic strip version of Mickie is itself hard to track down because, for reasons unknown, of the multitude of papers that ran Western Newspaper Union material, and the Mickie Says panel cartoons, comparatively few ran the strip, at least at first. In the Guide I cite a start date of February 4 1921, but since then I've managed to push that date back to August 28 1920, and I have little doubt that the start date could well be nudged back even a little farther with additional research. The 1920s were the glory years for Mickie the Printer's Devil, when hundreds, perhaps even over a thousand small town and farm community papers ran Mickie the Printer's Devil. At some point WNU even seems to have offered the strip as a daily, as it can be found running that way in a few papers. Whether this was a function of using up the backlog of weekly strips, or if Sughroe was actually producing daily material, is unknown. 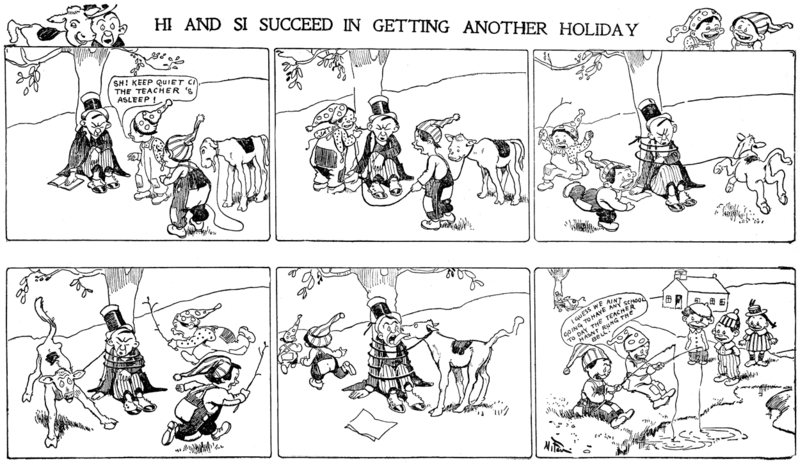 By 1930, though, Sughroe seems to have gotten a little tired of his strip. The drawing quality took a downturn and the strips become text-heavy on a regular basis (in fairness, Sughroe was never averse to filling up an occasional strip with a lot of text). He also might have been stretched too far, as he was now also producing the strip Such is Life for WNU. Starting around 1930 the number of papers that run Mickie drops precipitously, and it doesn't seem to be because they have dropped the WNU service. Maybe WNU started charging extra for some features, including this strip, or maybe Sughroe was no longer producing the strip on a regular basis. It's hard to tell; the record is unclear. In any case, the last paper I can find that seemed to be running the strip on a regular basis last printed it on December 8 1932. The Mickie Says panels, on the other hand, were printed (almost certainly reprinted) for years to come. I've seen them running well into the 1940s in small papers. Thanks, interesting article. I had run across a couple of printing plates for Mickie Says panels and didn't know anything about the comic, so this info was quite helpful. I won't ask you for an appraisal, since I plan on running the plates on eBay and have read your contact FAQ ;) -- but it was nice learning a little about the items. 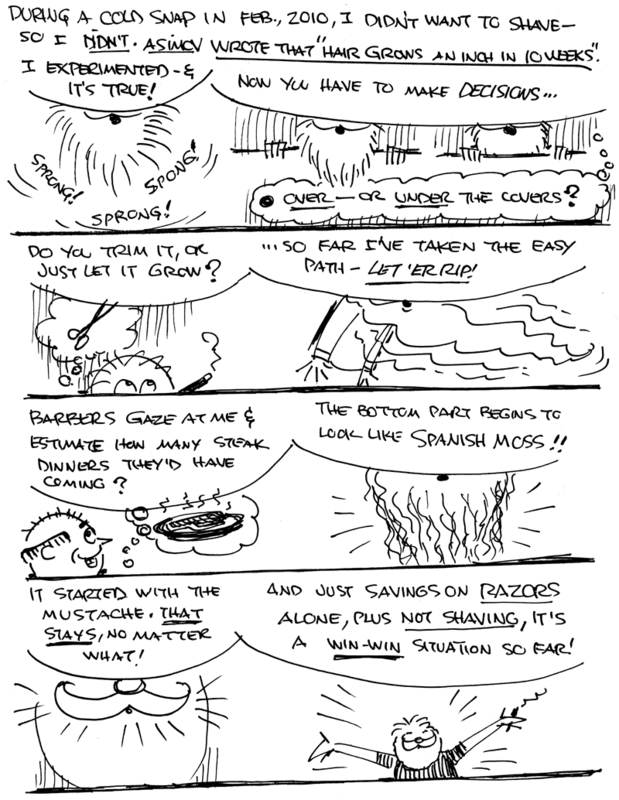 Allan's note: Since Jim submitted this Sunday Comic he has been shorn (voluntarily). No doubt there is a Sunday Comic a-borning on the subject of the loss of his Santahood. PS -- Just between you and me he looks fifteen years younger. Goodbye Lazarus Locks! I was not a big fan of the beard. I agree, he looks younger without it. The handlebar mustache is a given though. Ha ha, love the Captain Haddock reference (over... under... blistering barnacles! ).